"Skilled only in destruction, Bol'Goreth tempers a dull mind with savage might." Bring power and pestilence to your Descent: Journeys in the Dark game with the Bol'Goreth lieutenant figure. 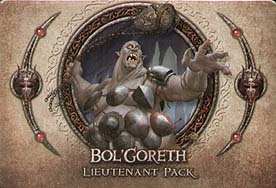 This pack also includes the "Raging Infection" plot deck and threat tokens, giving the overlord additional game options and the ability to recruit the mighty Bol'Goreth into any Descent: Journeys in the Dark campaign.